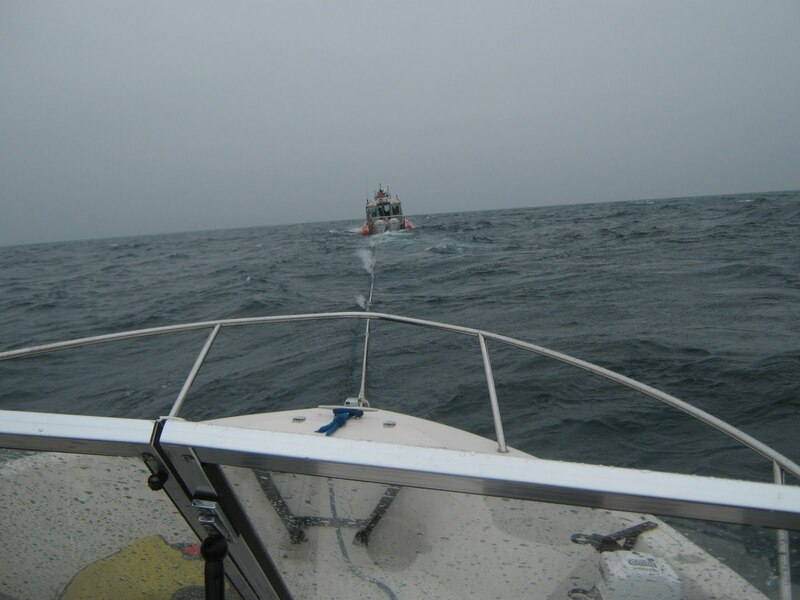 The Coast Guard towing us towards shore was a happy, if unwelcome, sight! the Brother Nature's motor unexpectedly revving up to high rpms as the boat slowed to a quick stop. Motor going faster, boat going slower–something is amiss! Eventually, I learned a gear had given way or the propellor shaft had broken in the lower unit. The immediate problem was we were drifting with the wind approximately 5 miles offshore of Ludington, MI. I switched to channel 16 on the radio and hailed the US Coast Guard Station at Ludington. Once contact was made, we switched to channel 22 and I explained the situation. No immediate danger, no medical problems, just a no-go boat. The Coast Guard attempted to call local firms with tow boats but none were available so they launched their fast response vessel and came to our aid. 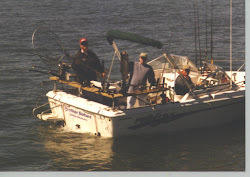 Thanks to GPS technology and marine radios, finding us was no problem and soon we were hooked up and underway. We were safe, but our Ludington fishing trip became more an adventure and less a fishing trip than we’d hoped. A new "bottom-end" will be on the Brother Nature’s outdrive early in the week so we’ll be back for fishing adventures by Labor Day weekend. What does a fishing captain do when he goes on vacation? He goes fishing! It’s not as unusual as it might seem on the surface. People often choose their work because it’s a good way to earn a living. Why else would there be garbage collectors, proctologists, crab fishermen in the Bering Sea or any of the other "dirty jobs" Mike Rowe features in his TV show. Being a fishing guide isn’t a good way to earn a living, it’s a good way to make a few dollars doing what you like to do. Next week, myself and a pair of fishing friends will be making our annual pilgrimage to Ludington, Michigan for a week of sleep deprivation and fishing for king salmon. Why? Because year after year, Ludington is one of, if not the top port, in all of Michigan for salmon fishing. It’s where the fish are. Wild fish, stocked fish–hopefully some big fish and lots of them. But it’s fishing. Sometimes we hit ‘em good, sometimes we watch the wind blow. For me it’s no pressure. If we catch fish, great. If we don’t catch fish, at least I don’t have unhappy customers. We start early, stay late and get up early the next day to do it again. Wish us luck! A limit catch from last year! On a recent trip I took to Marquette, Michigan, Lake Superior charter captain, Terry Huffman, took a few minute detour from our way out to Stannard Rock to get up close and personal with one of the largest iron ore boats on the Great Lakes. The ship, named the James R. Baker, is one of only 3 carriers on the Great Lakes which measure 1000 feet long. Most of the lakers–the boats which only operate on the Great Lakes, never venturing out to sea - are 600 to 800 feet long. Most of the "salties," as ocean-going vessels are called are much shorter. The beam of all these ships are constrained by the width of the locks at Sault Saint Marie (to move from Lake Huron to Lake Superior), the locks in the Welland Canal (to by-pass Niagara Falls and move from Lake Erie to Lake Ontario) or the locks at the St. Lawrence Seaway to move ships up the St. Lawrence River and into the lakes. Here in Indiana with a major international port (the Port of Indiana) as well as several steel mills on the Lake Michigan shoreline, it’s a rare day when we don’t get to view one or more of these huge ships. Early in the spring and during the fall spawning run we often fish within spitting distance of the huge vessels. It’s all a part of the ambiance and vitality of Great Lakes fishing. 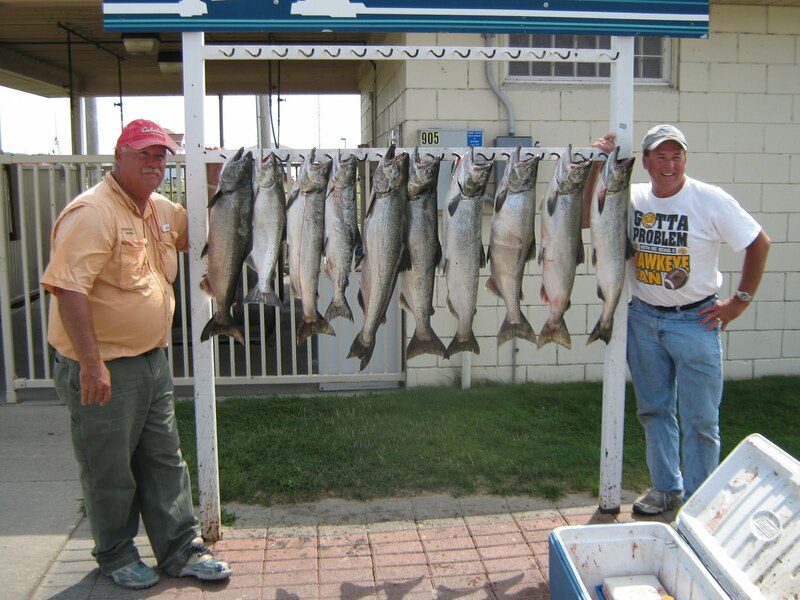 There are 5 species of salmon and trout available to be caught at our end of Lake Michigan. 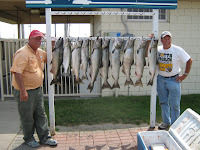 We catch cohos and chinook salmon (the Indian names)–also known as silver and king salmon. There are steelhead trout, lake trout and brown trout. Interestingly, the steelhead is genetically similar to a rainbow trout–often caught in streams or stocked into small ponds. The brown trout is also widely stocked, but it originated in Europe and isn’t closely related to either a steelhead or lake trout. The lakers are actually in the char family, which includes arctic char and brook trout. Catching all 5 of Lake Michigan’s common species in one trip is called the Lake Michigan Grand Slam. It doesn’t happen very often. It's only happened once on my boat and even catching 4 of the 5 – a mini-slam – is a rare occurance, happening only once every couple of years. Here are the happy fishermen that did the deed on the Brother Nature for the first time this year!